Italian Rye is perennial and very similar to Perennial Rye Grass in general appearance. The tufts are alike, but the branches of the Italian Rye rootstock are generally shorter and the whole plant forms a denser tuft. The stems on an average are higher and more delicate than those of Perennial Rye, from which they also differ in being decidedly rough to the hand when rubbed upwards below the inflorescence. When the plants are young they can be distinguished from those of Perennial Rye Grass by the leaves being rolled together when in bud. When fully developed, the leaves are comparatively broad, soft in texture and bright green. The inflorescence has the same general appearance as that of Perennial Rye but differs in some important points. 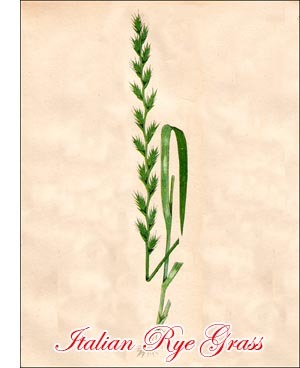 Thus a spikelet contains a greater number of flowers, generally from ten to thirty. Italian Rye Grass is indigenous to western and southern Europe, northern Africa and Asia Minor. It has been sparingly introduced into North America and is found in only a few places in Canada. It grows naturally in meadows, along ditches and roads, in gardens, openings in woods, etc. Italian Rye Grass is productive on soil rich in humus, sandy and calcareous loams, and on marls with enough moisture. It does not do well on stiff, heavy clays or on very dry soil. No grass repays fertilizers as well as does Italian Rye and where the soil is kept rich by liquid manure the returns are very large. In the valley of the river Po, in northern Italy, where the rich, loamy land is irrigated, and on the sandy soil in the vicinity of Edinburgh, Scotland, irrigated by the sewage from the city, it yields almost incredible quantities of forage. Although of more southern origin than Perennial Rye, it thrives comparatively far north. It is doubtful, however, whether it is of any general importance for Canada. It may be of value for the Pacific coast. The perennial quality of Italian Rye is not so outstanding as that of Perennial Rye Grass. It is rather shortlived and generally disappears after the second year, especially if it is allowed to produce seed. It starts early in the spring and where liquid manure is given the growth is so rapid that ten tons of grass to the acre have been obtained six weeks after sowing. It loses its flavour and nutritive value more quickly than does Perennial Rye and for this reason it should be cut when the spikes begin to develop. Where conditions are favourable it may be cut three or four times in a season. Italian Rye Grass was probably first cultivated in northern Italy. It is recognized as a good fodder plant in most European countries and is grown extensively, especially in England and Scotland. On account of its early start and rapid growth, Italian Rye is a hay grass of outstanding merit, where the climate is favourable, either alone or with other grasses or clovers. It is a fine pasture grass for short rotation, relished by all kinds of stock. Sheep, on being turned into a field sown with Italian Rye and Red Clover and cut for hay, prefer the grass to the clover. It makes a valuable feed for dairy cows, and, in spite of its succulence, does not produce purging in the animals. On account of its high yield it is said to be unrivalled among the grasses for soiling, and its rapid growth makes it useful for the suppression of noxious weeds.